The purpose of our research is to understand why people succeed or fail at their goals, particularly health goals. Success or failure is the outcome of self-regulation, or the process of guiding one’s actions toward the attainment of a goal. Self-regulation involves not only preventing goal-inconsistent acts (typically referred to as self-control), but also promoting goal-consistent responses. Because self-regulation requires focused effort during both brief moments and across a lifetime, our studies span time frames ranging from a few seconds to a few months. Further, because the psychological events involved in self-regulation can be investigated at multiple levels of analysis, we study the interactions among neural processes, subjective experiences, and behaviors in each time frame (see Figure 1, below). We believe that the best way to bridge levels of analysis is to combine the distinct strengths of several research methods. Therefore, our research approach integrates functional magnetic resonance imaging (fMRI) with cross-sectional and longitudinal survey methods, laboratory experiments, and randomized controlled trials. A complete understanding of how and why people succeed and fail in their goals requires studies that employ several of these techniques within the same study. Beyond that, bringing these methods together can yield new insights that would have been unattainable in any one field alone. Our research program does exactly that by bringing together several levels of analysis theoretically, methodologically, and statistically. Figure 1 (above) displays our model for studying self-regulation at a range of time frames along the X-axis and using multiple levels of analysis along the Y-axis. The figure depicts where several of the studies described here fit into the conceptual space. 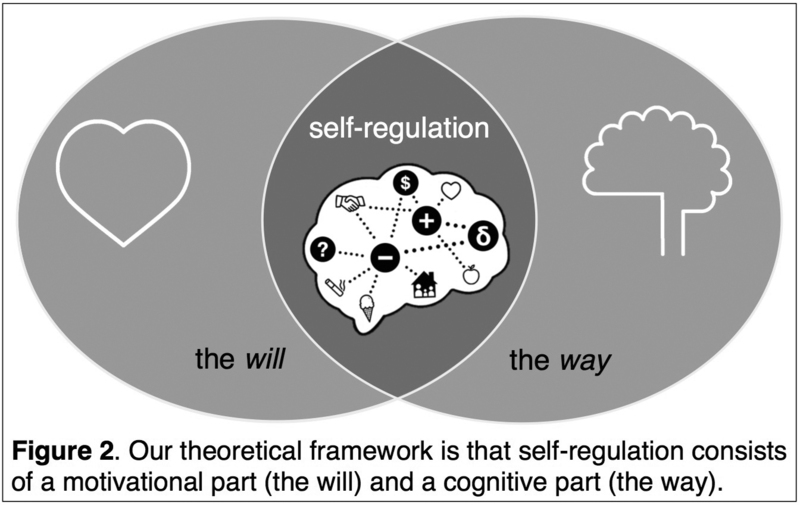 The overarching framework that guides the work in our lab is that self-regulation consists of two fundamental parts: one motivational (the will) and the other cognitive (the way). The will refers to the motivational and affective processes that drive goal pursuit such as approach motives, and the way refers to the suite of cognitive capacities and abilities that enable goal pursuit such as inhibitory control (see Figure 2, left). Neither part is sufficient on its own; both are necessary for effective self-regulation. The two main lines of research in our lab correspond to these parts. The central aim of these lines of work is to elucidate the psychological and neural processes that contribute to the outcomes of everyday goal pursuit, particularly health behavior-change goals such as cigarette smoking cessation and healthful eating. Below is a discussion of selected previous and ongoing studies conducted in our lab that enable us to understand the will and the way of self-regulation at one or more time frames and at multiple levels of analysis. Self-regulation is predicated upon a desire for behavior change. For example, the act of smoking a cigarette is considered self-regulation failure only in the presence of a goal to stop smoking. 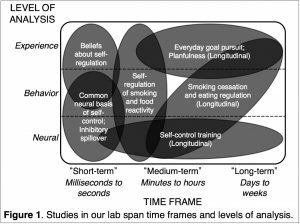 There are many ways to conceptualize this example, but in a hierarchical view of goals (Carver & Scheier, 1998), smoking the cigarette is a lower-order goal and not smoking the cigarette is a higher-order goal. Which of the two is enacted depends in part on which goal is more desired, prioritized, or important in the moment—in short, which is more valued. This is the central ideal behind the valuation model of self-control (Berkman, Hutcherson, Livingston, Kahn & Inzlicht, in press; see Figure 3, above). The valuation model is grounded in the insight from the fields of social neuroscience and neuroeconomics that decisions related to self-regulation such as choosing a larger-later reward in favor of a smaller-sooner reward are the result of a multifaceted value integration process with known biases that takes place in the ventromedial prefrontal cortex (vmPFC) and other mesolimbic dopamine regions such as the orbitofrontal cortex and the ventral striatum (Hare, Camerer, & Rangel, 2009; Kable & Glimcher, 2007). A total subjective value is calculated for each possible action in a situation, and the action with the greatest value is enacted. Our lab has investigated this in several ways. In one study, we found that monetary incentives can improve inhibitory control, and that this effect is mediated by interactions between lateral cortical regions and vmPFC (Kahn & Berkman, under review). This result is consistent with the idea that increasing the value of control improves it. We also found that only prevention acts, such as resisting a temptation, cause self-regulatory fatigue (“ego depletion”); in contrast, promotion acts, such as goal striving, facilitate subsequent acts of self- regulation (Miller-Ziegler & Berkman, in progress). It may be that tangible progress toward a goal, which is characteristic of goal-promotion acts, increases the salience of the goal and reduces its perceived costs, increasing its subjective value. In a third study, we found that inducing a minimal degree of social identity increases prosocial choices at the expense of individual gains (Berkman et al., 2015). Finally, we find that activity in the vmPFC among smokers while viewing quit-smoking messages predicts their subsequent behavior change during cessation (Falk et al., 2012; Livingston, Hill, Yee, & Berkman, in progress). Together, these and other results converge on the idea that the degree of self-relevance of a goal is an important moderator of its efficacy (Falk et al., 2012; 2015; Falk, Berkman, Whalen & Lieberman, 2011; Livingston et al., in progress). 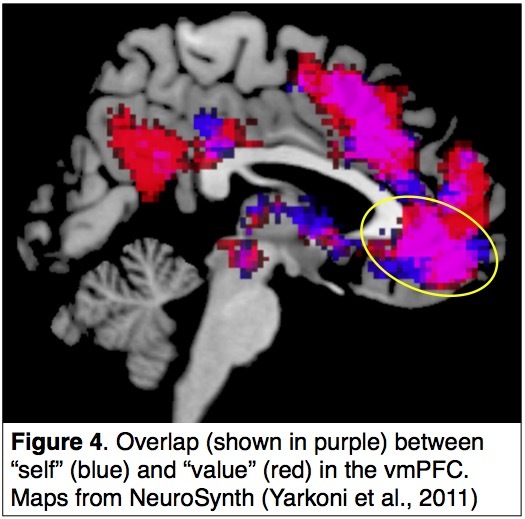 Notably, the locus of self-relevance processing in the brain is highly overlapping with that of value (see Figure 4, left). Together, these results suggest that relevance to the self, or identity, might be an especially potent special source of value. 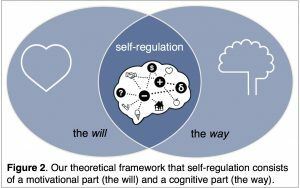 The major theoretical contribution from our research on the will is articulated in the Identity-Value Model of Self-Regulation (Berkman, Livingston, & Kahn, 2017), which is that goals that are seen as self-consistent are more likely to be achieved because they hold greater subjective value than other goals. Our current studies on the will are supported by funding from the National Cancer Institute (R01 211224 and R21 CA175241). These projects test the Identity-Value Model by manipulating the self-relevance of a goal (healthful eating) within an “RCT-as-experiment” research paradigm, and examining the effect on eating behavior, as mediated through neural and behavioral measures of subjective value. We received funding for the smoking cessation research from the Center for Excellence in Cancer Communications Research at the University of Michigan. Self-regulation also requires the cognitive and physical capacity to enact goal-directed behavior. The will alone is not sufficient. People also need to know how to change behavior – they need a way. In the smoking cessation example, the smoker’s desire to quit might far outweigh his desire to smoke, but he won’t be able to stop smoking unless he has the ability and capacity to do so. Much of our work focuses on situations, such as in smoking cessation, referred to as self-control conflicts, where a higher-order goal conflicts with a lower-order goal. Self-control is the ability to bias behavior in favor of the higher-order goal, often by deploying inhibitory control to reduce the influence of the lower-order goal on behavior. For example, one way that the smoker could resolve the self-control conflict between smoking and not smoking would be to use inhibitory control to reduce his craving for the cigarette or his impulse to reach for a pack. Here, we focus on our work on inhibitory control, but we have also studied other cognitive processes including attention (Calcott & Berkman, 2014; 2015), planning (Ludwig, Srivastava, & Berkman, 2017) and working memory (Meyer et al., 2012). Given its importance in self-control and self-regulation, we have conducted several studies aimed at understanding the basic cognitive neuroscience of inhibitory control. 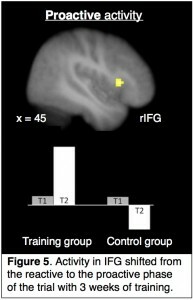 For example, it had been theorized but not proven that inhibitory control efforts across a number of response domains (e.g., motor, affect) draw upon a common resource. We provided evidence that the inferior frontal gyrus (IFG) is active during inhibitory control in each of the affective, behavioral, and cognitive domains (Berkman, Falk, & Lieberman, 2011; Cohen, Berkman, & Lieberman, 2012). Together, these studies suggest an important role for the IFG as a nexus for inhibitory control across domains and implicate the region as a possible target for intervention. Whether and how training-related improvements in inhibitory control transfer across these domains is an active area of research in the lab right now. That various forms of inhibitory control share a common neural pathway suggests the hypothesis that training on one form of inhibitory control would alter the common pathway and then “spill over” into other forms of control (Berkman et al., 2009; Berkman, Graham, & Fisher, 2012). We conducted a longitudinal inhibitory control training study to examine the neural effects of this kind of training (Berkman, Kahn, & Merchant, 2014). We found that behavioral performance on our target measure improves with training, and, as performance improves over time, activation in IFG (and other regions) decreases and begins to peak slightly earlier in time within each trial (Figure 5, left). These data suggest that the IFG can be trained to respond to cues that are predictive of when stopping might be required, evincing a “proactive shift” to anticipate when inhibitory control is needed and engage earlier. However, this shift does not transfer across domains (Beauchamp, Kahn, & Berkman, 2016). We have several studies that apply this basic research to understand and increase health behaviors. 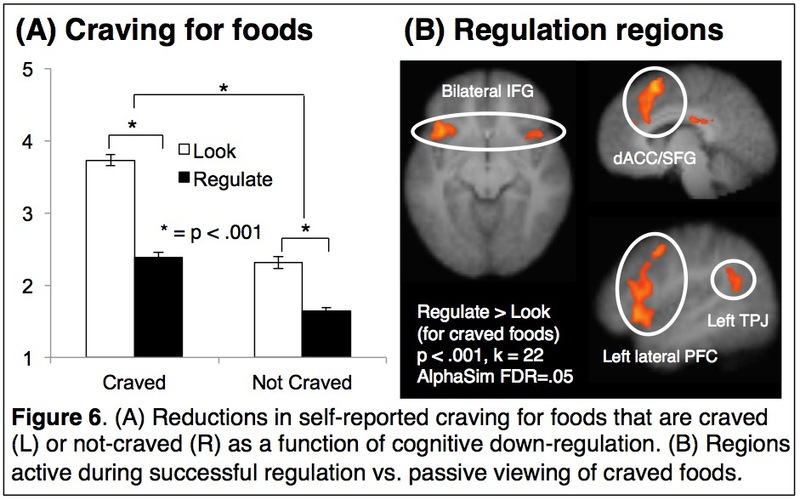 Much of this research focuses on inhibitory control related to cravings, or the appetitive drive to consume a stimulus, because cravings play a critical role in precipitating relapse (Berkman, Dickenson, Falk, & Lieberman, 2011; Giuliani & Berkman, 2015; Shiffman et al., 2004). For example, our research shows that the degree of activity in the IFG and related regions during inhibitory control at baseline predicts success during a smoking cessation attempt (Berkman, Falk, & Lieberman, 2011). In work led by Nicole Giuliani, a former postdoctoral scholar in the lab who is now an Assistant Professor, we developed a paradigm to study how people inhibit their cravings for energy-dense foods (Giuliani, Calcott, & Berkman, 2013) and to identify which neural regions are active during this kind of inhibitory contr ol (Giuliani, Mann, Tomiyama, & Berkman, 2014; see Figure 6, right). A recent follow-up study using the “brain-as-predictor” approach that PI Berkman (Berkman & Falk, 2013) showed that the degree of activity in these regions is uniquely predictive of food craving and food intake during a two-week longitudinal experience sampling study (Giuliani, Tomiyama, Mann, & Berkman, 2015). Ongoing studies complement this work on effortful control of craving by focusing on increasing motivation to change behavior. The overarching goals of these lines of work are to identify the processes that are predictive of behavior change and to target them with intervention. Our current studies on the way are supported by funding from the National Institute on Aging (R01 AG048840). This project builds on our result that training causes a cue-dependent proactive shift in inhibitory control by incorporating personalized risk cues into the training paradigm. The target population is mid-life adults who experienced early adversity, which is often associated with difficulties in inhibitory control. We also receive support for other inhibitory control training studies for at-risk adolescents, which incorporate peer cues into the training, from pilot funds from the Center on the Developing Child at Harvard University and from the NIDA P50 Center for Translational Drug Abuse Prevention housed at the Oregon Social Learning Center and at UO. These lines of research on self-regulation have the potential to improve people’s lives. We take two complementary approaches to making sure this research is applied for the greater good. Most importantly, we include vulnerable and diverse populations in our research because these groups have the most to gain from evidence-based treatments. For example, early adversity alters neurocognitive systems including those related to motivation and inhibitory control. Therefore, individuals who experienced high levels of early adversity, particularly children and adolescents, may be the most likely to benefit from interventions that target those systems (Shonkoff et al., 2012). Our work increasingly adopts this translational neuroscience approach, which leverages neuroscientific knowledge about underlying systems and how they develop to target them with theory-based interventions. We also strive to disseminate knowledge about self-regulation to general audiences. For example, PI Berkman regularly writes about research in our lab and related labs on his blog at Psychology Today, The Motivated Brain, and other outlets such as The Conversation. Students in the lab write “pop abstracts” on the lab blog and for The People’s Science to accompany their published papers and presentations. Each of the ongoing studies in the lab fit broadly into one of the categories described above. Please contact us if you are interested in participating in our research!